To start, my hat goes off to Doug Sleeter, and the entire Sleeter Group team for pulling all the right people together at the 9th annual Sleeter Group Conference (one of the most successful networking shows I’ve been to this year). From Monday evening’s Keynote session featuring executives like Rod Drury of Xero (who came in all the way from New Zealand), Sage’s Himanshu Palsule, and the legendary Greg LaFollette, to Wednesday afternoon’s closing session presented by none other than Rick “The Closer” Richardson (sorry I missed it, Rick – but so happy we got to have lunch! ), Doug brought out all the big guns. For me, the greatest value in a show like that isn’t the things I learn from sessions – and isn’t the prospects that I meet in the trade show expo area. It’s all about the networking time. People always ask me how I manage to keep up with all the traveling I do, and the real answer (even when I’m as tired as I am right now) is that I just don’t want to miss out. There’s nothing better than the ability to spend 5 minutes with René Lacerte – or having the pleasure of catching up over dinner with Jennifer Warawa. When I departed the conference, I took my networking on the road…my next day started out with one of CPAPA’s 25 most powerful women in accounting, Geni Whitehouse – someone I’ve always seen at shows, and have heard about for years, but we hadn’t had a chance to spend quality time together. As if one legend a day isn’t enough, I ended my evening with one of the only reasons to visit San Jose on a regular basis: Taylor Macdonald just might be in town. Spending time with Taylor is sort of like learning at the master’s feet. I think I turn into a sponge whenever I’m around him, hoping to soak up as much advice as possible…what a privilege I’ve had to be included in his network these past several years. While all of this was happening, one continuous networker (who I never actually saw in person) that always adds the right color to the mix, Xero’s Community and Coffee Queen – and lover of the best color ever, Catherine Walker was a constant social media presence. People like Catherine are true examples of leveraging social media to shrink miles between a network. While I ran out of time to stop by and share a premium local coffee with her, I somehow still feel connected to Catherine as we exchanged numerous messages on Twitter. While we can only be in one physical place at a time – we can reach the entire Twittersphere with a simple 140 characters. In my last post I declared that there’s no replacement for face time. While I firmly believe this, leveraging our social network can often create lasting impressions on those relationships we hold so dear. I make a living selling technology. I’m passionate about the fact that technology is changing the world for the better, and I’m proud to say that I have a front row seat to watch tomorrow’s technology become today’s reality. Numbers don’t lie. When we survey XCM users each year after the busyness of tax season, we are thrilled to hear that our technology often saves our clients well over an hour a day per person. On the Xpitax side, without both scanning and Cloud technologies, this outsourcing model would be impossible. When you look at it that way, it’s hard to find anything to complain about as far as technology goes…or is it? Let’s be real for a minute – who are we kidding? We all deal with technology trials and tribulations virtually every day. How often are you tempted to throw your iPhone across the room when you’ve dropped a call for the 3rd time in 10 minutes (not to mention that you were still talking for 2 minutes before realizing the like was dead)? Sure it’s great that you can book your airline reservations from the amazing little device, but sometime you just simply want to make a phone call. How about those web-based training sessions that you’re struggling to understand because you can only catch every third word of the presenter and his slide deck is moving about 28 seconds slower than his talk track? Why do we all just accept this as “normal” and go about our business pretending it isn’t a problem? It IS a problem, because it keeps us from concentrating on our main goal. As technology advances and enable us to have more access to information when & where we need it, typically as automated as we want it, we are able to be more productive as we adopt the “self-service” approach. I know I use this every day when it comes to tracking packages online, paying bills, booking travel arrangements, and numerous other areas of personal and professional life. The danger comes when this dependence on using technology takes over the desire to have human interaction, and foster relationships with clients, colleagues, and partners. connect with clients, prospects, and even friends and family via GoToMeeting, WebEx, or Skype can shrink the distance between two individuals. These technologies allow me to start a Friday morning on a team call with my colleagues around the country, to present Xpitax to a firm in Nevada in the early afternoon, and to meet with a local SoCal accounting firm and show XCM for Client Accounting Services all in the same day – all without leaving my “soffice” (Sofa+Office). But what do I give up by not being in person at these various meetings? And what happens when the technology I’m relying on lets me down? I sat in a board room this past week at a very large accounting firm in the Midwest. While I made the effort to fly out and be on-site for the meeting, I relied on web telephone conferencing to include my President in the meeting with me. By the end of the meeting, we had reconnected the web conference twice, and redialed into the teleconference three times. Needless to say, the flaws in technology were not only distracting, but extremely stressful too. The saving grace was my ability to interact with the group inside the room, to make eye contact, read body language, and even poke fun and make light of the frustrating technology failure. Thankfully, the meeting was still a success, but had I not been there in person, it might have had a different outcome. As the world seems to move faster & faster each day, it’s so important that we do step back and remember that deep down, we all value personal interactions. Sure it’s easy to sit back and say that it’s more productive to conduct business from your comfy office chair…but don’t underestimate the power of a real handshake. Shortly after starting at XCM I had the opportunity to visit two prospects in New York – both were very busy, but agreed to my visit. I have no doubt that the relationships I started building that week will continue to be vital to the future success of these two clients. As I arrived home late that Friday afternoon, I had a voicemail from one of the firms I had met with. The message said something like “I wanted to call you and give you the good news – because you were the one who showed up at our office…”. So don’t be afraid of a little TSA pat down – before you know it you’ll sporting premier hotel status and plenty of airline miles to boot…go out and build those relationships – maybe I’ll see you on the road (I’m the one with the bag full of shoes). When I came onboard with XCM and Xpitax this past Summer, I was quite familiar with the XCM workflow solution itself as well as with most of the team. I had spent time with them at various trade shows, and worked with them as fellow partners in CloudSolutions Alliance. The side of the house that I was less familiar with was our Xpitax outsourced accounting services business – and the international team behind those services. I’ve since come to learn that in addition to our team in Braintree (and the handful of remote folks throughout the US), I have the pleasure of calling another group -developers and tax professionals from our Chennai and Bangalore offices – fellow Xpitax colleagues as well. During my first few weeks on the job, I asked a lot of questions about the international Xpitax team. Who are they? Does the same team work with one client or is it more like a call center environment? What are the conditions like in our India offices? How do our clients communicate with our team in India? I was definitely feeling a bit out of my element, and a tad unsure of exactly how to explain the way our outsourcing model really works…mostly because it was just a big unknown. Naturally, most of us don’t care too much for the unknown, so I figured if I need to sell these services, first I have to believe in the model myself – which means get educated. Well a few weeks ago the world got a little bit smaller. After a recent trip to India, our Founder and CEO (yes, Professor Workflow himself, Mark Albrecht) addressed our U.S. team with a plea to unify our multiple offices. With that in mind, our VP of Client Services, Colleen Osborne (with some help from Facebook), created an interactive platform for our teams to communicate, share photos & ideas, and learn about each other. I’m sure some might say I’m just easily amused, but seeing photos of our team and having the opportunity to wish them a happy holiday (last month they celebrated Vinayaka Chathurthi, a national holiday in India) completely brought these people to life, and gave me a whole new perspective on this part of our company. Just as important, it proved once again that technology can truly bridge the gap in physical miles – and even time zones. Without platforms like Facebook, the Xpitax team would still be a list of emails in our Outlook contact group “Chennai”, but with the medium to interact with them, I’ve begun to make a whole new set of friends. Likewise, without solutions like XCM, the outsourcing model of Xpitax wouldn’t be anywhere nearly as successful as it is today, where an accounting firm can track the status, open points, estimated completion date, number of open items remaining, and several other elements of any outsourced return, anytime (most firms don’t even have that much control over returns or projects inside their own firms, let alone one that is being completed by someone half-way around the globe). With Cloud-based tools like these, geography instantly becomes a non-issue, and productivity becomes the big priority. 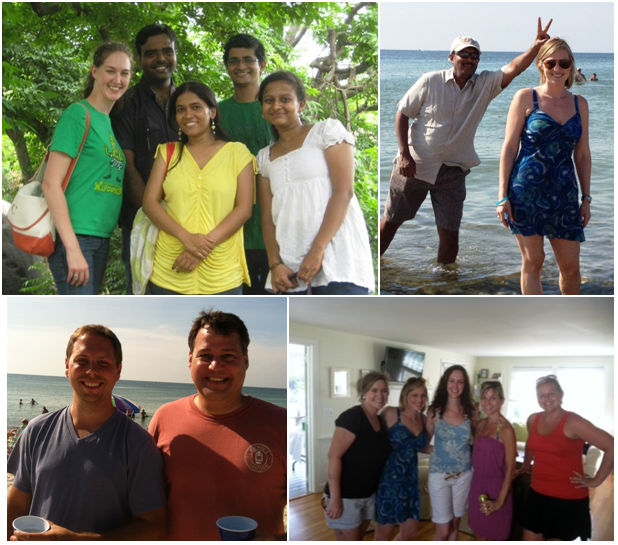 With the launching of the new Xpitax Facebook group, I decided to post some photos from a recent company outing we had in Cape Cod, figuring it would give the India teams a chance to see some of us outside of the typical work setting. I was caught by surprise (in a great way) when photos appeared just hours later showing Colleen and a few of the folks from the team in India at the beach during her recent visit. I guess the old adage is true – it really is a Small World After All!